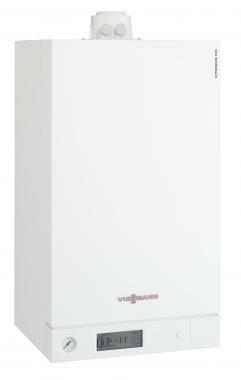 The Viessmann Vitodens 100-W combi gas boilers are available in three outputs. The 30kW version would be suitable for a two or three bedroom properties but if you require more or less power there is a 26kW and 35kW version. 30kW should be enough to cope with one bathroom and en-suite. Your installer will be best placed to advise what output boiler you require. As with most Viessmann boilers this range of boilers is compatible with LPG if you aren't connected to the gas mains. Weighing in at 38kg and measuring 70x40x35cm you'll be able to hide this boiler behind a standard kitchen cupboard but leave at least 70cm clearance at the front so it can be serviced. In terms of standard controls you'll get an on/off switch pressure gauge and separate hot water and central heating temperature control dials. As with all boiler to get the highest level of efficiency you'll need to add external controls like room thermostats and thermostatic radiator valves.